Length: 1″ to 3″ above my ankle bone. Just enough ankle peeks through! Rise: high-rise. It’s the perfect rise for a tucked-in shirt. Thanks for visiting – hope you’re having a great week! Love this trench so much! I really understand you love these pair of ankle pants as they are obviously perfect! Very elegant and stylish look! Such a classy and perfect for Spring outfit! I like your trench very much! This is gorgeous and perfect for Spring! I love the whole look! It makes me crave that warm Spring weather even more! Loving your neutral and white. Great look! I love how the coat and your waistline perfectly match up. This outfit fits you perfectly! 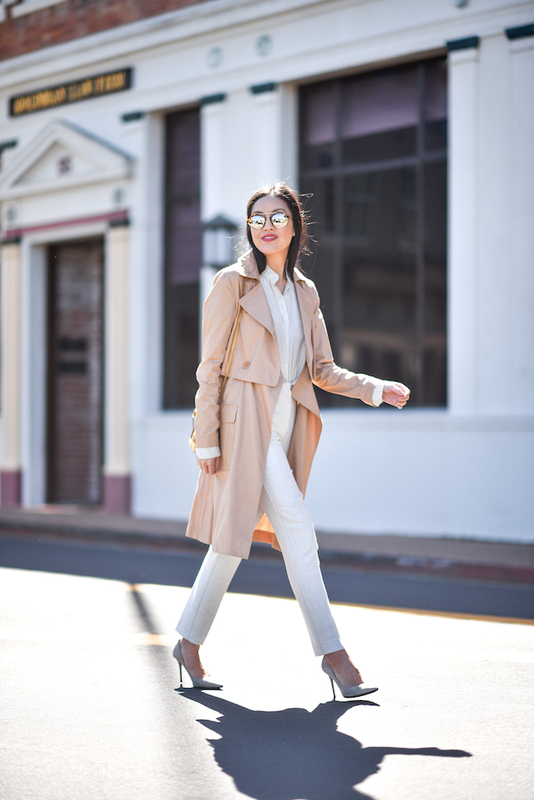 Your trench is absolutely stunning it pairs perfectly with your trousers! Great outfit! Hi Anh! What size did you take in the Frame blouse? Thanks! I’m a long time silent fan! I love your style. What size is your Tibi trench coat Ahn?–never tried Tibi outerwear so curious how they run. Thank you! Love this post! Ankle trousers are my favorite as of late. I love what you look for, especially the length. I’m 5’8″ so sometimes the “regular” length is a bit too short and looks awkward. Loving this outfit on you! Love that lightweight trench, gorgeous! Pants are hard to pull off for me since ankle length turned into longer length haha! These trousers are such a perfect fit on you. Love this smart chic styling lovely, and the sunglasses or beautiful! I, too, can’t resist ankle length pants! You look really nice! I love the trench! Hi Anh! Sorry the question is not related to this post, but what size is your Veronica Beard blazer in the earlier post? Thanks! May I ask what size you took in the Tibi trench? thank you! Hi Anh! I’ve never tried Frame Denim blouses before. What size did you take in your blouse above? Do they run similar to Theory/Equipment? Thanks! By the way, love your blog! You make everything look so good! Hi – thank you so much!! They run a little roomier than Theory and pretty similar to Equipment I think! I’m wearing a size S, but I have a navy version in an XS and that also works! Hope that helps! This look is so perfect! Love the colors! Love it. This is 100% my style! Over the years I’ve transitioned to mainly dresses (so easy!) but this outfit is making me lust for my ole ankle length trousers again! Amazing look! You look stunning. Such a classy and cool outfit! Loving this beautiful and chic look. Gorgeous color palette. You look really elegant and sleek in this outfit, love the fit of the pants on you! These trousers are perfect. Like the color and length. I adore that trench on you!! Super pretty and the perfect color to pair with your white outfit. Spring vibes!